Premier Houseboats are pleased to present Curlew, a 1974 Fairline Fury in good condition both structurally and mechanically, and available to use as a leisure boat, holiday or weekend home, or full time residential home. Curlew has been well maintained by her current owner and offers surprising space as well as being easy to manoeuvre, be it coastal or inland waterway cruising. Curlew offers a double cabin with two single berths that can be converted to a double, with ample built in storage. The main saloon has a table and seating for 5, this can also be converted to a double berth. This area has an LCD tv and CD radio. The galley area comes with a 2 ring burner and oven, microwave, new cutlery and crockery, kettle, new towels, and a sink with hot and cold pressurised water supply There is a separate cloakroom with sea toilet and hand basin. The cockpit area has panoramic views and comes with GPS, VHF, and log echo. Fenders, warps and car anchor are also supplied. She is economical to run, smart looking, and capable of speeds in excess of 20 knots. 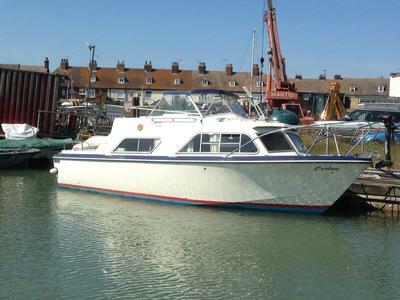 Well maintained throughout, she is ideal to be used around the waterways of the UK, and could comfortably be a full time home or weekend retreat. Vessel name: Curlew Vessel condition: Good Designer: John Bennett Make: Fairline Model: Fury Year constructed: 1974 Berths: 5 Cabins: 2 Heads: 1 No. of engines: 2 Engine model: Volvo Penta AQ130E Engine power: 260 Fuel type: Petrol (Gas) Drive type: Other Length over all: 24' 9" Beam: 10' Maximum draft: 2' 6" Hull material: Glass Fibre Hull type: Other Hull colour: white Disclaimer Premier Houseboats offers the details of this advert in good faith as it was presented by the seller or his representative but cannot guarantee or warrant the accuracy of this information nor warrant the condition of the described item within this advert. A buyer should instruct his agents, or his surveyors, to investigate such details as the buyer desires validated. The Item described within this advert is offered subject to prior sale, price change, or withdrawal without notice.